This beautiful waterfront home welcomes you to a luxurious private enclave on the Caribbean Sea. Mature palms, ferns and ornamental shrubbery evoke a tropical feel before you step through the front door. Upon entering the villa, your eyes are drawn through the living room's 40 foot wall of windows and out on to the white sand beach and shimmering calm blue water. Welcome to Kai Zen. 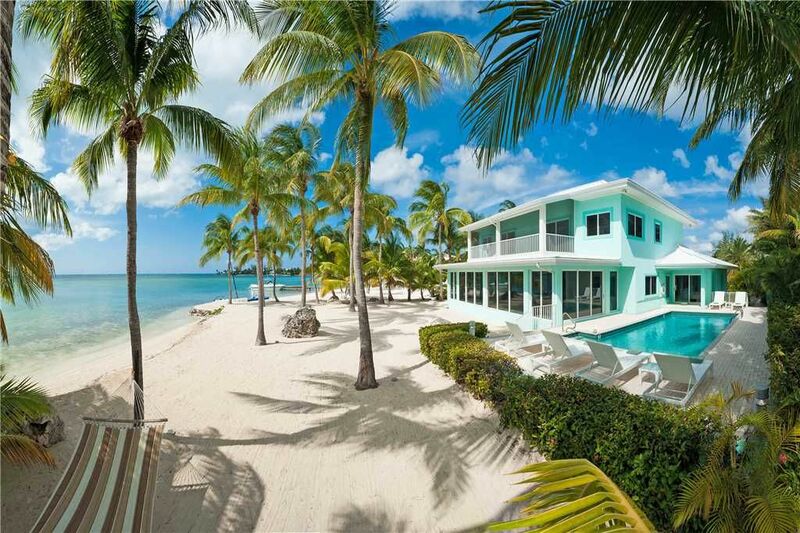 This stunning contemporary villa with an equally stunning secluded beach is located in the private resort neighborhood of Cayman Kai. The owners prefer a minimal "zen" decor with clean lines, crisp white furniture and open space. This is a non-smoking villa, including the upstairs covered verandah and outdoor areas. This two-story luxury villa is a great family or multiple-couple villa offering amazing sunsets and barefoot swimming from a palm-shaded beach. Boasting over 4,000 sq. ft. of living space, Kai Zen features 2 oceanfront master king suites on the upper level, plus a queen guest suite with direct access to the pool deck on the lower level. Suites on the upper level open up to a covered verandah overlooking the water. All suites include private ensuite baths with stand-up shower, plenty of space and countertops for guest items and toiletries. is only a 5-minute walk from the Kaibo Yacht Club to the south and a 10-minute walk to the Rum Point Club to the north. Chances are you will not see a soul on your beach the entire stay! — Stunning sunsets! Kai Zen is fantastically located with unbeatable views of the azure waters of the Caribbean. — Private freshwater pool with hedges and landscaping ringing the beach area. — 6 lounge chaises and side tables around the pool deck. — White sand palm-shaded barefoot beach with a hammock, dock, and an outdoor shower. — Outdoor dining table and chairs for barefoot dining and a propane grill for cookouts by the sea. — A fully-stocked large kitchen with adjacent stainless bar, high-end stainless steel appliances, and quartz counter tops. — Open concept living room with 50” flat screen TV with over 100 channels and a blue tooth speaker. — Private den on the first floor with a large desk, chair, and lamp for guests that need to conduct business while on vacation. The owner asks guests not to use the den as a 4th bedroom. — Fine linens, luxury towels, toiletries, and beach towels are all provided. Maid service is available for an extra charge. A minimum of 3 hours are required and can be arranged directly with on-island property manager. Payment must be made directly to the maid on the day of service. Managing over 70 oceanfront villas and booking over 250 condos on Seven Mile Beach, Grand Cayman Villas & Condos offers the largest inventory of bookable vacation properties on Grand Cayman. With it's on-island hospitality company, Silver Thatch, Grand Cayman Villas & Condos has raised the bar on guest services. A newly built welcome center was designed with the guest��s vacation needs in mind and includes a private fitness studio, and business center. Our dedicated staff is prepared to assist with charter and reservation recommendations for family dinners, snorkel safaris, or at-villa services like grocery delivery, massage treatments, private chefs, and more. In addition, guests can conveniently check-out complimentary snorkel gear, baby equipment, coolers, bluetooth speakers, Apple TVs, and other items to enhance their vacation experience. Call or email us any time with any questions you may have and we will be happy to assist. Open concept living room with 50” flat screen TV with over 100 channels and a Bluetooth speaker. A fully-stocked large kitchen with adjacent stainless bar, high-end stainless steel appliances, and quartz counter tops. Private freshwater pool with hedges and landscaping ringing the beach area. Kai Zen is only a 5-minute walk from the Kaibo Yacht Club to the south and a 10-minute walk to the Rum Point Club to the north. Chances are you will not see a soul on your beach the entire stay! Beautiful beach front home with amazing views! It does not get much better than this! This home has it all. Central location in Rum Point area with easy walks to Rum Point (restaurants and water sports) and Starfish Beach. The home has all the modern amenities along with access to kayaks and paddle boards. Swim in the pool and watch the sunsets! Highly recommended for a family visit to Grand Cayman. Thank you for you kind review. Kai Zen is a special home and a fantastic location. Well manage property in quiet location and protected bay. This is a wonderful and peaceful place! It was just like in the pictures. Thank you for your kind words. Please come back soon!!! My family of 5 got to stay at this amazing property in June. The property managers did a great job of being abvailable when there was a problem. Hot water wasn’t working when we first arrived and someone came and fixed it 5 minutes after notification. The location is ideal. Beautiful beach with calm waters, perfect for my kids who are 4 and 2. The sun sets right behind the home so watching it every night was definitely our routine. Every time we left to go explore we ended up not staying long because nothing beat Kai Zen. Easy walk to Kai Bo where we got coffee every morning. Nothing but great things to say about the property and the management team... We will definitely be coming back! We were very pleased with this house with it's private pool and beach. Woke every morning to breeze blowing through the palm trees. Spent every evening watching the breath taking sunsets from the patio. The house is well stocked with kitchen necessities, towels for the pool, and toiletries. We were able to rent paddle boards and jet skies just across the street from the house. Since the house is on the sound, we all quickly mastered the paddle boards on the smooth waters. Went out daily to check on 2 starfish that seemed to live right off our beach. It was great to be on Rum Point away from the cruise ships and tourist. But it was still an easy drive back to Georgetown to shop for souvenirs. We were there for 10 days and really didn't want to leave. Great place to stay!! Best location on the island. Owners are very friendly and villa is well maintained. Cos Kai enjoys a beautiful barefoot white sand beach and northwestern sunset views facing the Stingray Sandbar. One can walk barefoot all the way down to Starfish point about a mile away. The Kaibo is only 300 yards from the house and an excellent place to grab a morning coffee, casual lunch, or elegant dinner in their upstairs dining area. The Kaibo also has a marina and is where many private charters will collect guests for private deep-sea fishing trips, snorkel safaris, or charters to Stingray City.